Q: What do you get when you cross an Australian soccer legend with a bestselling children's author? 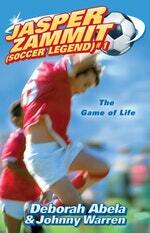 A: Johnny Warren and Deborah Abela's soccer series for kids! Jasper Zammit is a soccer legend – at least in his own head. Whole stadiums shout his name as he bends balls, accepts trophies and scores magic goals for the Rovers Under-11s. When a new girl, Lil, joins the team, Jasper thinks he's found someone as obsessed with soccer as he is. But there's one hitch - Lil's dad is the reason Jasper's dad has lost his job. Can the two still be friends? Love Jasper Zammit Soccer Legend 1: The Game Of Life? Subscribe to Read More to find out about similar books.